BIGGEST EXPOSE: The SHOCKING nexus between AAP and The Hindu newspaper! 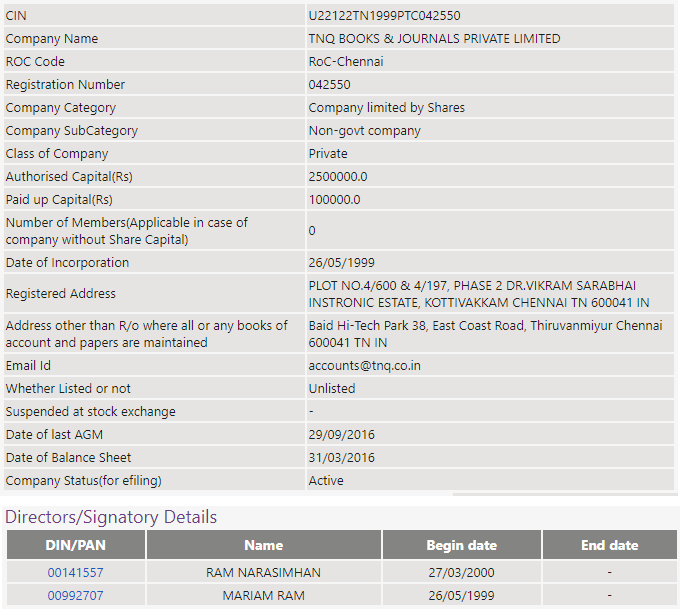 Should N. Ram, publisher of a famous paper, donate to a party, even if it is in her personal capacity? When Aam Aadmi Party was launched in late 2012, they managed to create a huge buzz among the citizens of Delhi. They made a decent start in the 2013 elections, but they reached the peak of their popularity only during the next election which was held in 2015. Between 2014 and 2015, AAP was at the peak of their popularity, and there were two main reasons for this. The first reason of course the push they had received from the Anna Hazare faction, but to be honest, the second and main factor which contributed to their victory was the Indian media. AAP had full page ads, and several journalists who were going out of the way to give AAP a good name. But till date, there was no explanation or solid proof for why the media was really supporting them. Going through the old databases of AAP’s donor list, we came across something that shook us. Although AAP’s donor list is now unavailable online, we got in touch with some sources deep inside the party and got it verified that the media had actually contributed huge sums to AAP! One such popular name that popped up, was that of N. Ram, the former Managing Direcor and Chief Executive Officer of The Hindu. There were 3 donations that we were able to trace and verify back to our source within Aam Aadmi Party. The first donation amounting to Rs. 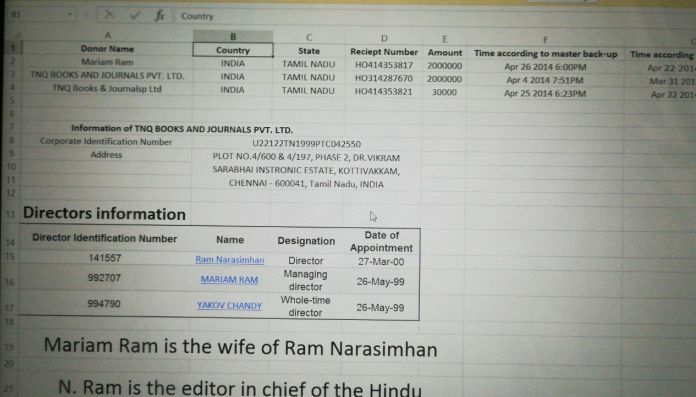 20 Lakhs was made by Mariam Ram, the wife of N. Ram. The other two donations which total to Rs. 20 Lakhs and 30 thousand were made by a company in which both N. Ram and his wife are directors and share holders. What is interesting is that both these donations were made to AAP at a time when they were gearing up for their second round of elections. The first donation of Rs. 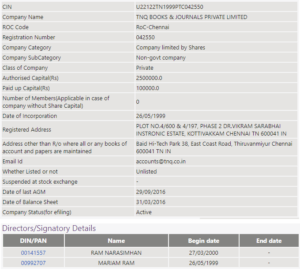 20 Lakhs by TNQ Books and Journals Pvt Ltd was made on Mar 31 2014 at 12:00AM against receipt number HO314287670. The second and third donations of Rs. 20 Lakhs by Mariam Ram and Rs. 30,000 by TNQ Books and Journals were both made on Apr 22 2014 at 12:00AM vide receipts numbers HO414353817 and HO414353821, respectively. What is interesting, is that all these three donations were made exactly at 12:00AM, once again raising doubts whether this is another case just like the infamous “Hawala at Midnight” scam, in which AAP was caught. It still remains to be seen how N. Ram will react to this expose. The left leaning journalism of N. Ram, who was once the student wing leader of the Communist Prrty in Tamila Nadu, and the same attitude of The Hindu is very well known. Yet, one simple question remains to be answered, is it right on the part of a media house to donate to a political party? This article was complied based on inputs from Sanjay Shiva R.
Yes, ‘The Hindu’ became ‘anti Hindu’ more than 2 decades ago. The newspaper has lost its past glory and credibility too gradually. Now,another Iyengar, Kamala Haasan has entered the Hindu baiting team.Some even say that Kamal has converted as a Christian,possible N.Ramis also under the influence of Church.N.Ram is blatantly anti-BJP,anti-Modi who went to the extent of allowing Manmohan Singh write a highly critical joint editorial against demonetisation.Alost the entire English language media in India is anti-Hindu with the The Hindu leading the tribe. Mr. Ram has dragged the name of “The Hindu” down the drains. He can think in terms of renaming the paper as “The Anti-Hindu”. It will fit in Communist way of looking at things. For Commies, a pen is “anti-pencil” and vice versa. Worst part of The Hindu is they publish :ghost headlines” (sensationalising like “X” cooks beef etf.) and when questioned by “X” paper says, THE HINDU had reproduced an article (of some 4th grade Tamil paper to escape the consequences. It was a child-habit for me and millions in (TN, AP, Karnataka). But I no longer read “The Hindu”. The HIndu is loosing circulation even in Chennai, papers like ToI and even Deccan Chronicle have eroded its circulation. May be “like the Dawan” of the past, Ram will make “The Hindu” a relic soon. It’s the biggest irony in India that the newspaper named “The Hindu” is perpetually anti-Hindu in its approach to political reporting. As for the legality and morality of the Rams having the right to give donations to a political party, the basic issue is their honesty in publishiing unbiased coverage of that political party. Has “The Hindu” done that ? Not at all. Therefore, the right to donate funds to a political party by a newspaper must necessarily be linked to its unbiased coverage of that party. As long as that is not done, there definitely is conflict of interest insofar as it is against the interest of the general public that read the newspaper. Well said, Mr. Lavakare. That is exactly right. 101% true. Ram has shamelessly hijacked the good will created by his forefathers in the name HINDU. Morever, as typical convert, he has been painstakingly demolishing HINDU belief and traditions and creating and expanding the market for anti-hindu forces. I ve stopped purchasing hindu and also discourage my friends and family especially my children from reading the HINDU long long ago. He does not have guts to speak about practices in other religions for fear of being lynched. Any way the damage done to him by hindu and his own family in the name of professionalising the newspaper cannot be undone now. I have been reading Hindu for many years. And I have been noticing this bias in their reporting. The only problem is that it required this much wait, for this government has to break the spine of the Lutyens Journalist to see through. I am not sure if they have some many grudges against hindus they can drop that name Hindu from their publications – after all for the sake of money right? I feel there is nothing bad in donating to the party. If he is personally donating something from his heart then it want be any scam. I am also against AAP party leaders but it doesnt mean that a individual cannot donate anything to the political party then tomorrow same media will ask why people donating huge donations in the temples or charity organisation. Come on be mature let everybody stay independently in our country. Every individual has rights to donate to a political party in a democratic country. Just that when it comes to social responsibility like media, as long as they are unbiased, there is no issue. Ram is a pseudo journalist and a card-carrying member of the Communist Party of India, but living in Penthouse! Some Communist! He is a jackass! Sad to see the reputable name of Kasturi Iyengar and the great HINDU paper (not great anymore) being dragged in mud. N.ram for unknown reasons has been very vindictive and vitriolic towards anything to do with Hindus. One can sense his seething anger and hatred in his interviews. It’s high time someone in the higher up exposes his wheeling dealing… maybe he is a bigger charlatan than prannoy roy. Media preaches. We have to listen them but they are not for them to follow.They are beyond corruption. NDTV, Hindu are being funded by antinationals. How can we expect them to behave differently. This man is a compromised man with shady dealings in every sphere of his activities, be it his journalism or personal life involving a woman named above who donated huge sums of money. Both shouild be investigated for anti-national acts and financial frauds..
Why they can not donate?All individuals have right to pursue their political leaning. Mr. And Mrs. Ram, in their personal capacity can donate if they so wish. As a media house, they should have majority shareholders’ support. If it is declared in their IT returns, then it is legal and moral too. To prove it is moral, then they should declare it before their readers/viewers.